Thoughts in a Haystack: There Are Worse Places . . . There Are Worse Places . . .
Just imagine it was sand instead of pavement. From the U.S. Geological Survey Photographic Archive. In front of the Zoology building was a peculiar sight. 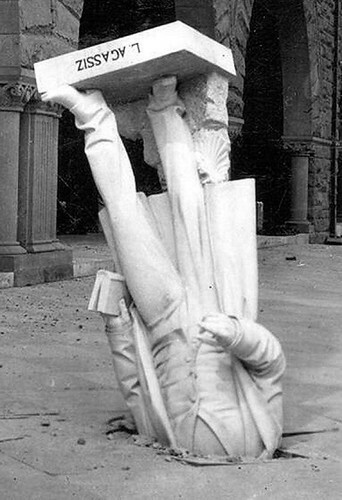 A large statue of Agassiz pitched off a platform on the second story and plunged headfirst through the pavement. That was the one funny thing in the whole scene of wreck and ruin. They have been joking about poor Agassiz ever since, calling him the head foremost scientist of America, a man of great penetration, and one who was alright in the abstract but not very good in the concrete. I can't wait to feature this one! Oh, and Hi, John! LOL.